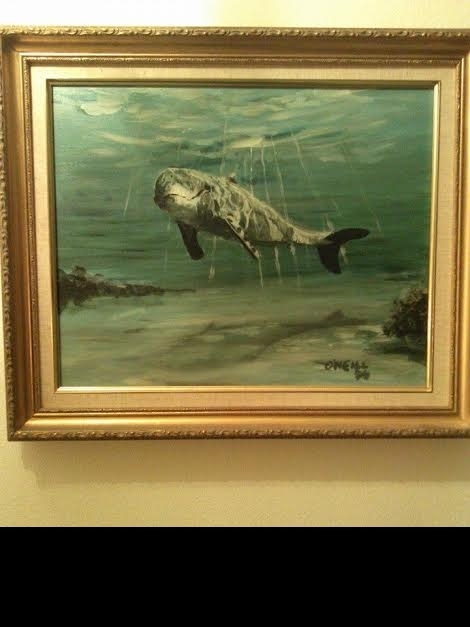 This is my very first Peter O’Neill original painting. I first met Peter at a little café on St George St. in St Augustine FL through my dad who had a shop on St George St. It was on a Sunday & we had just come from Mass & we went there to have breakfast & Peter was in there & had several of his paintings on display in P.K.’s Café. It also happened to be my birthday & I just fell in love with this one painting in particular. It is of a dolphin, under the water, almost to the surface & to me it looks almost 3D. I absolutely LOVE anything ocean, beach scenes etc. but dolphins & whales are my favorites so of course this one stuck out to me. I remember telling him how beautiful I thought this painting was & we continued on with our breakfast. The next thing I know, Peter walked away & came back with the painting & said here, I want you to have it, happy birthday! I was floored & I thanked him, but I told him I just can’t do that & he insisted. I still said thank you so much, but I just can’t & he looked at me & said why not?? You think it’s beautiful & that is the BEST compliment you could EVER give an artist so please, take it. And please remember I had JUST met him! I STILL have this painting & it hangs in my front walkway. THANK YOU PETER!! I’ll NEVER forget that!! !